I started my first knit afghan this weekend. I chose the Hue Shift Afghan from KnitPicks.com. In my first day of knitting, I completed two squares (out of one hundred). 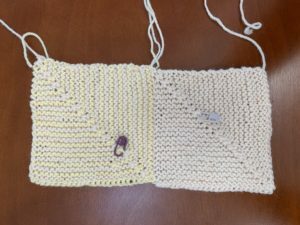 So far, my observations are that the pattern is easy to memorize and that it’s definitely going to help me add more knitting skills (like picking up stitches and working with two colors).